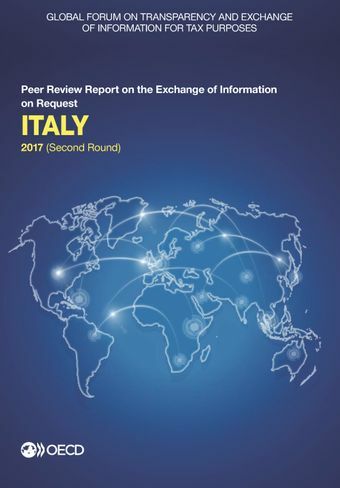 This report contains the 2017 Peer Review Report on the Exchange of Information on Request of Italy. Italy was found to be Compliant with the international standard on transparency and exchange of information upon request. This represents an upgrade from the previous overall rating of Largely Compliant as Italy has taken measures to speed up ratification process of its EOI treaties and has maintained an excellent record in terms of ensuring the availability, access and exchange of different types of information. Ownership, accounting and banking information is available in Italy in line with the standard. In particular, Italy's law contains multiple obligations requiring availability of beneficial ownership and apply robust supervisory and enforcement measures to ensure that these obligations are properly implemented in practice. The relevant information is accessible by the tax authorities. Italy has an extensive network of exchange of information partners covering 146 jurisdictions and is heavily involved in exchange of information practice, as demonstrated in the large volume of incoming and outgoing information during the reviewed period (1 October 2013 to 30 September 2016). Italy's exchange of information practice generally provides for effective exchange of information, even though Italy is recommended to monitor measures recently introduced to further streamline its exchange of information processes so that all requests are responded in a timely manner.